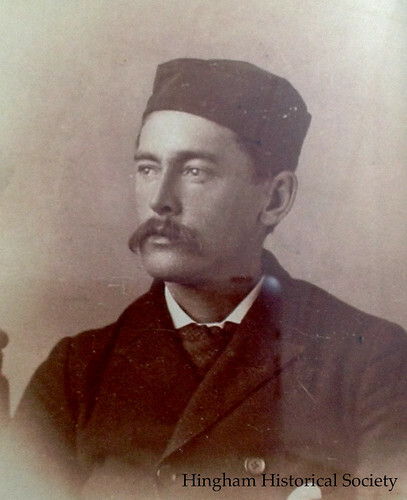 Rogers was born in 1854 in Cambridge, the middle son of three boys born to Edward Coit Rogers, a widower, and his second wife, Elizabeth Lothrop Seymour, daughter of Joel and Polly (Whiton) Seymour of Hingham. Edward and Elizabeth were both educated, intellectual, active in social reform and the abolitionist movement, authors and members of the Universalist Society. Photograph of Franklin Whiting Rogers. Courtesy of David and Shirley Rogers of Hingham, Mass. In 1856, Edward suffered failing health so Elizabeth brought her young sons and their half-brothers back to Hingham to live with her family. Edward died in 1860 and young Franklin was raised in Hingham until age 16, when he moved to Boston to attend art school. He later entered the studio of J. Foxcroft Cole, a fine painter in the French Barbizon style then fashionable: nostalgic rural landscapes often in misty light. A talented student, Rogers advanced rapidly with his master. European training was considered essential to further a painter’s career so Cole turned his promising student over to artist Thomas Robinson of Boston who studied in Paris and excelled in painting of animals and landscapes, which later became Rogers’ specialties. Robinson made frequent buying trips to Europe for prominent New England art dealers, as did fellow Boston artist William Morris Hunt, who helped introduce the Barbizon painters to the avid Boston art market. Robinson also promoted local artists and it was through his studio that young Rogers met Hunt, then at the height of his career. Hunt, a respected teacher, became a lasting influence on Rogers’ career as an inspiration and mentor: his guide-book for artists taught “a way of seeing that stressed emotional carrying power and individual feeling expressed in a painterly style.” Hunt’s work was influenced by the technical bravura of French artist Thomas Couture and the spiritual fervor of Jean-Francois Millet. Rogers exhibited often and widely and in 1884 returned to Hingham with an established reputation and following for both his animal and landscape subjects. Working from a studio on High Street, he expanded his circle of artist mentors and friends and became acquainted with Winckworth Allan Gay and Alexander Pope, noted local artists. In 1886, Rogers moved his studio to 33 Free Street where he bought a home; he worked there until the end of his life in 1917. The studio no longer exists but his house has remained in the family where his grandson, David, and wife, Shirley, live today. Rogers painted “alla prima,” a more straightforward broad application of paint compared to the classical technique of building a painting with a series of transparent glazes over a monochrome underpainting. Strictly defined, an “alla prima” painting would be started and finished in one session but the term is also more loosely applied to any painting done in a direct and expressive style that promotes painterly freshness of response to the subject. 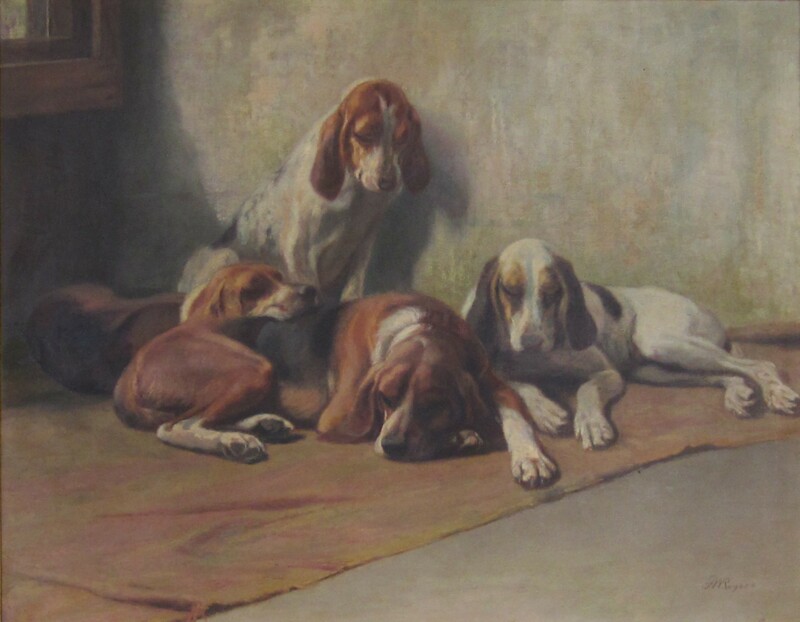 But Sisters, or Four Hounds (reproduced below) was not painted in one afternoon! Capturing the poetic informality of the pile of sleeping dogs on a dusty blanket, required a great deal of preparation—followed by revisions, over-painting and even some glazes for the finishing touch. Rogers would begin by creating charcoal or pencil studies of group-ings as well as studies of each animal to get acquainted with their personality and body. A series of small “thumbnails” would be created next as he experimented with the group composition – finally settling on a classic pyramid grouping that leads your eye in a circle of nodding heads. Next, value studies would help establish his patterns of light and dark born known as “chiascuro,” that serves to model the dogs’ bodies and organize the interior space. His next step would be to create “a map,” lightly drawn marks to indicate the shapes in his composition—or he may have massed in shadow shapes with thin paint and used a rag to pull out paint for areas of light. When satisfied with this preparation, Rogers mixed oil colors on his palette and applied them according to the rule of thumb “lean over fat,” which means initial paint strokes would be executed with paint thinned a bit with turpentine with the thickest application of paint, “impasto,” saved for areas in light painted last. 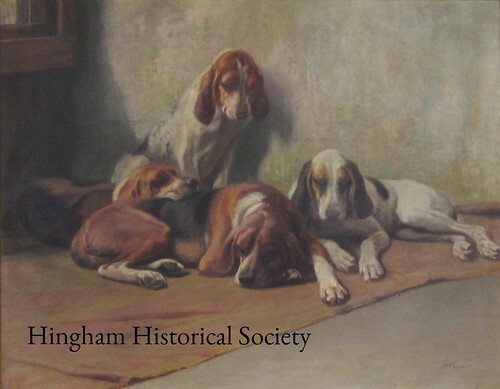 In the ballroom of Old Derby hangs a grand, late 19th-century masterpiece of canine portraiture titled Sisters or Four Hounds. It was painted by Franklin Whiting Rogers (1854-1917), who lived in Hingham most of his life. He painted from his studio and home on Free Street for most of a long career which spanned the post Civil War years until 1917. Sisters or Four Hounds, c. 1880. This work of animal portraiture is unusual for its nearly life-size depiction of a group of dogs rather than a single animal proudly posed to display its best features. The somnolent dogs, piled together on an old rusty brown rug, are painted life-size and up close. The painting is so evocative it almost breathes the scent and sighs of warm sleepy dogs who are resting after the hunt and have just enjoyed the reward of a big meal. There is a large snowy landscape by Rogers that hangs in Hingham’s Town Hall by a second floor meeting room—you can see it on the way to a hearing or meeting. 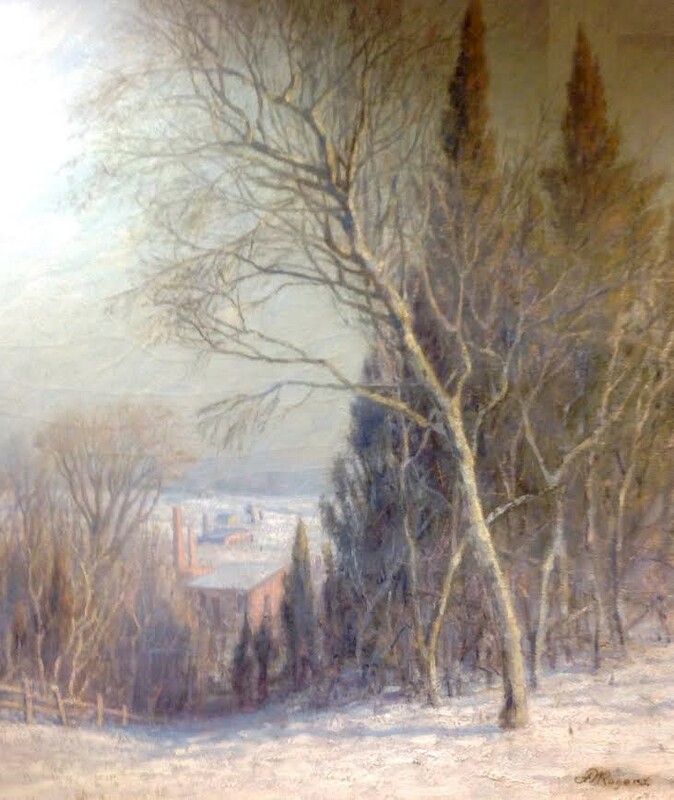 Broadly painted and bathed in sunshine, the snowy scene is a sweeping view from Turkey Hill, according to family lore. Down the hill behind treetops is an unidentified building with a tall stack—perhaps an old shingle mill. The painting captures the frosty atmosphere of sky and subtle color shifts of snow. These two paintings have long been available for us to see but probably few know much about the artist, who was raised in Hingham and became a talented and successful painter. Both works exemplify his success at painting subjects much in demand by Boston art collectors during the 19th century: rural landscapes and portraits of pets and livestock. Country landscapes infused with atmospheric light became very popular after Boston artist William Morris Hunt introduced and promoted French Barbizon-style paintings to New England in the 1850s. American artists were quick to fulfill the public’s taste. As he studied animals so he studied trees and truly grasped their character. He was ever fond of nature. A long life spent in the woods and fields along the shores of this and neighboring towns filled his mind with knowledge and love of the more subtle and delicate aspects of landscape. Whether painting landscape or animals, Rogers’ sensitive empathetic nature enabled his work to be expressive of an individual character, not just a generic likeness. Throughout life Rogers owned many dogs and painted them with love and respect. 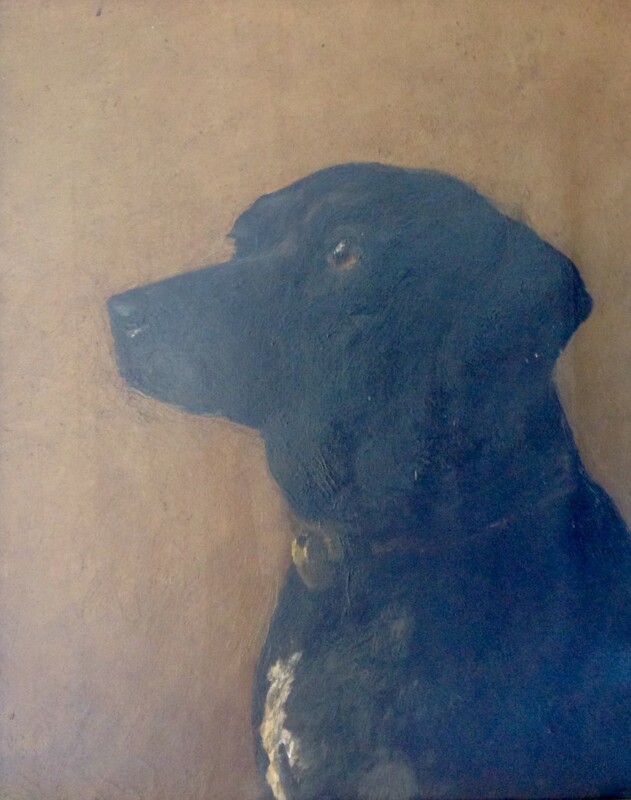 His Dog Bruno is an endearing portrait of a black mixed breed that hangs in our Historical Society archives. Due to eye problems in his last years, Rogers turned to painting “en plein air.” His difficulties did not prevent him from continuing to be a prolific and talented painter.